All praises to our God and King - with His marvelous help, we reached 300 sales in our etsy shop last week! All we wanted to do back in 2009 was share our faith through Stuff From Trees. Danny makes wood gifts and I work with paper, hence the very clever title, right? 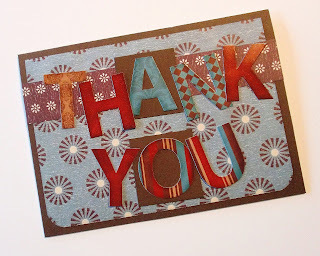 We've met some amazingly wonderful people along the way, many of whom are now repeat customers. My humble and overwhelming thanks to those reading this. Our success has absolutely nothing to do with anything we've done and everything to do with the blessings of the Lord. It's been an interesting trip over the past two and a half years - and here's what we've learned. * Even when the customer is wrong, the customer is right. * Fix mistakes as soon as they happen and apologize for the inconvenience. * Be consistent - in what you say, what you do, how you do it and how you present yourself. * Have fun! When it's not fun anymore, find out why. We switched to a new bird seed this week. Our birds go through feed like crazy, and we keep it coming so we'll have a wonderful flock of birds to watch right up next to the house. It's fun to see them pick through the seed for their favorite kinds. It's a mix of seeds, and apparently some types of birds like certain kinds more than others. It will cause an occasional fight and even lead to birds chasing each other off. But what is most interesting is how every single kind of bird will throw one type of seed on the ground. They'll scrape it out with their beaks or kick it out with their feet, just so they can get to what they want. Other birds, maybe less aggressive birds, will eat that seed off the deck. But the others won't have anything to do with that filler seed - they want the good stuff. On Sunday, July 29, I will turn 35 years old. According to Scripture, this means I am possibly halfway through my life - and that's an amazing accomplishment. I know why I'm celebrating, and it's only partially because of my birthday. We have been given this example from the Psalmist - we WILL rejoice and be glad, simply because this day was made especially by God for us for this moment. Make this a weekend of celebration. Maybe it's your birthday, maybe it's an anniversary, maybe it's another special occasion. Or maybe it's simply another Saturday and Sunday that you get to celebrate on this earth. Celebrate the day that the Lord has made - today. Rejoice and be glad in it - today. God's instruction. Husband. Family. Things around the house. Issues at work. Church, brothers-in-Christ and sisters-in-Christ. Finances. Errands. The world situation. Government. Evil in the world. Today's to-do list. What day today is. (It is Thursday, right?) 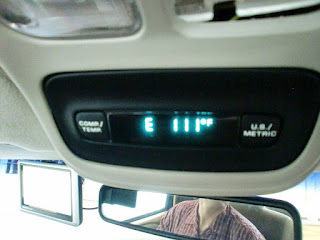 The weather, the heat and the drought. Running a home business. Finding time to eat, sleep and maybe relax a little. So ... what are you thinking about at this moment? Is your brain cluttered with a bazillion different things? Does it feel like something important might be oozing out your ears? The female mind is an interesting place to be. We're not only multi-tasking physically, we're trying to multi-task mentally as well. And for most of us, that just doesn't work. 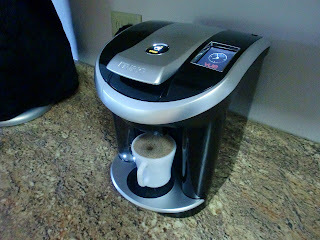 We needed a new coffee pot ... desperately ... so we splurged a little and got the new Keurig Vue. Now, I don't usually given product endorsements, but this machine is so worth it, that I just had to tell you about it. Basically, you keep the water chamber filled all the time and use the newest version of the individual coffee packs Keurig has invented. There aren't as many flavors yet as there are for their older version, but they say they're on the way. The convenience: It's programmable, so it will be all warmed up and waiting when its little internal timer goes off. It only takes a couple of minutes to heat the water, and you can program it to start up and shut down whenever you want. Plus, it uses prepackaged grounds, so you don't have to measure anything. Have you ever had one of those projects that just swirls around in your brain for days and weeks and months? 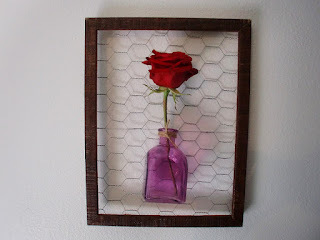 This chicken wire frame flower vase art was mine. This week I finally had all the supplies on hand - a $4 picture frame from the thrift shop, chicken wire from the farm supply store, the vase I gave my mother-in-love flowers in when they were here to visit and some twine from my craft room. Yes, I let Danny do some of the hard work. You have to take the frame completely apart, including removing the glass, and some frames have some staples left in. He was sweet enough to take them out for me with a pair of needle-nosed pliers. That was a huge help! 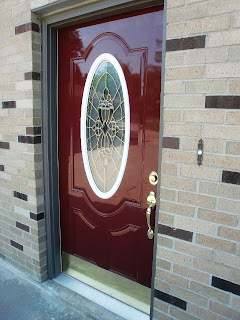 Once you get the frame down to its bare bones, you'll need a pair of wire cutters and a staple gun. Each of these was easily accessible in our garage. Danny showed me how to use each one because, to be honest, I had never had to use them before. Danny and I went for a bike ride Saturday night - from our house, up the highway and all through town. We saw some parts of the city that I hadn't seen since I was in school. Just a lovely time of riding and talking - something we sorely needed. 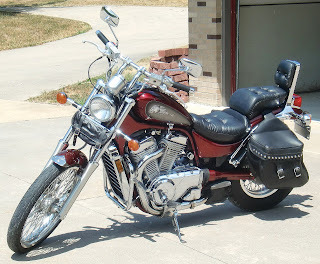 As we were riding, and thinking about our ever-growing marriage, I realized how intertwined the two really are. 1. The rider has to trust completely. On the back of a motorcycle, the rider has no control over when and how the bike moves. She has to turn herself over entirely to how the driver is going to handle the bike. This is trust and this is submission. I believe with all my heart that Danny is going to be extra careful and extra safe with me behind him, so I can relax and allow him to do what he neds to do. This is a marriage characteristic that we oftentimes overlook. There were several grape vines staked behind our new house when we moved in. We weren't sure what they were going to be at first, but this summer they exploded into beautiful fruit. 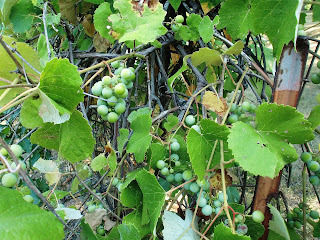 It's been so hot and dry for the past few weeks that the grapes are very unhealthy. They're basically rotting on the vine because they don't have the right weather and water conditions to thrive. Instead, they're turning brown and caving in. Over the weekend, I decided that I was going to grill - all by myself. Now, I've helped plenty of times, even planned the menu before, but I've never done the whole process alone. Danny was going to be at work all day Saturday, so this was the perfect opportunity. I went to the grocery store and got a package of fresh beef short ribs and four large pork chops. It's good to be in Iowa. I added four twice-baked potatoes and eight crab-stuffed mushrooms to the order and I was set. I marinated the beef in beef broth and onion soup mix for about two hours, and marinated the pork in chicken broth and onion soup mix for two hours. A few minutes before I was ready to grill, I took everything out of the fridge so it wouldn't be cold when it went on the grill. 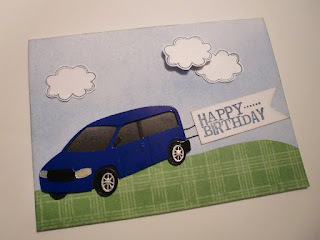 I was able to fill a special order of birthday cards for my dad last week. There were 24 of them - each one different. Special. One of a kind. I made the first few cards in the "traditional" birthday theme. They were all covered with cake and candles and balloon animals. They looked great, but I was quickly running out of birthday-themed embellishments. As I was preparing to rush to the store and stock up on more cake and candles and balloon animals, I realized that I could make a whole series of cards that weren't so blatantly birthday. They could be beautiful, natural cards like this one - my absolute favorite - and still be a birthday card. It's often very smart, and very creatively stimulating, to stop before you shop and see what's already in your supply stash. 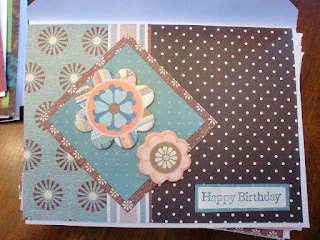 You can create stunning cards with what you have on hand and make them in whatever theme you'd like. And save the cake and candles and balloon animals for the party. ... then stay out of Iowa for a while. 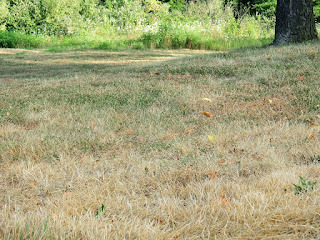 We're in the middle of a 25-year heat spell and intense drought right now. This 111 degree day was the one Danny spent in the garage building my prayer bench. You just keep doing what you have to do. It's fun to read and listen to stories about global warming and how millions of years ago ... and how millions of years from now ... yeah, that's when I tune out, too. Yes, this may be a record-high summer across the country. Yes, it can be unbearable without air conditioning. Yes, it's uncomfortable to breathe when the humidity is so high. But there is something worse. I'm so excited - I met my workout goal! I increased my routine every day for two whole weeks! That may not seem like a huge victory to some, but to me, that was immensely fulfilling. I fought through the excuses, the pain, the discouragement and everything else to achieve what I set out to accomplish. Make this a weekend of working it out. 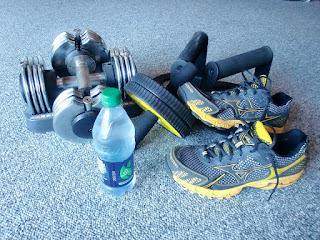 Physically: Start an exercise plan, change your eating habits or just get out and walk for a little while. Working out your body is a great way to praise God and thank Him for the health He's given you. Emotionally: Is there something holding you back from experiencing the joy of the Lord? Take the time this weekend to work it out - pray about it, journal about it, talk to a sister in Christ, whatever it takes for you to being working through it. For part of yesterday, Danny and I had to spend time in two different vehicles. At one point, I was leading because I had the GPS. For those brief minutes, I was a wreck. (Not literally, just emotionally.) I was concerned about going too fast and losing him, which I did for a minute. I had trouble focusing on the road in front of me because I kept looking in the rear view mirror for him. And I almost drove right past our destination because I lost focus on where we were actually going. Leading is difficult, whether it's in a car or in a leadership position you've been given. From the time I spent as a leader yesterday, and the time that followed as a follower, here are a few lessons I quickly learned. Who wants to turn on the oven or crank up the stove when it's 100 degrees outside? 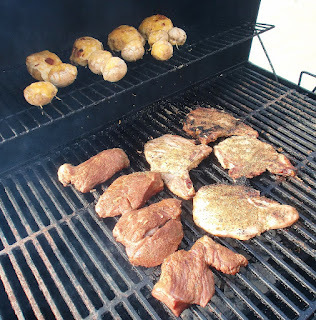 Even the thought of grilling, a summer cooking staple, can induce heat flashes over a certain temperature. Instead, think about some meals that don't require any heat at all. * Caprese salad - tomato, mozzarella cheese, olive oil and some basil. Super easy and so tasty! * Wraps - some deli meat, sliced cheese and some fresh fixin's. Serve with macaroni salad, potato salad or chips. * Fresh green salad with chicken - use a warm rotisserie chicken already cooked at the grocery store so you don't have to heat anything up yourself. * Chicken salad or tuna salad sandwiches - again, get your ingredients already fixed from the store to keep from cooking. * Hummus and pita bread - think appetizers and you'll have a light meal as well as a no-heat meal. * Shrimp cocktail - pre-cooked shrimp can simply be thawed and eaten, combined with a really great cocktail sauce. * Sushi - 'nuff said! My sweet and loving husband gave me my birthday present three weeks early. I had asked Danny for a bench that I could put down by the big pond. I wanted a place where I could go, pray and relax away from the struggles of the day. 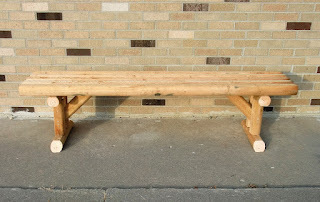 He blessed my heart in so many ways by creating this bench out of landscaping timbers with his own two hands. His talents amaze me all the time. But what meant even more was that he was willing to brave 110 degree temperatures to finish this just for me. That speaks volumes about the loving heart of this wonderful man. Thank you, Sweetie! I'm so excited to get it down by the water and spend some time with the Lord. The first thing I want to do is thank Him from the bottom of my heart for the husband He gave me. I'm blessed beyond measure. This is my ABC list for the week. I have printed it off and I'm going to mark off each one as I pray about them over the next seven days. I encourage you to do the same - print it, pray about it, adjust it to fit your own personal needs and see if your heart finds conviction to make some changes in your life for the Lord. He already has in mine. I can't wait to see what the week brings. Accept the week that God has planned for you. Believe beyond a shadow of a doubt that the Lord delights in you. Change your attitude in a drastic way. Determine to be dedicated and devoted to Christ. Escape the devil's grasp through repentance and prayer. Forgive...no matter how hard it might be. Go forth and take on the day knowing you walk with the Lord. Hope against all hope...in everything. Invite one family to come to church with you this week. Just live in the moment God has given you right now. Keep on keepin' on...even when it hurts. Happy Fourth of July! These tasty treats are going with me to the newspaper office this afternoon for the few of us who have to be there on the holiday. 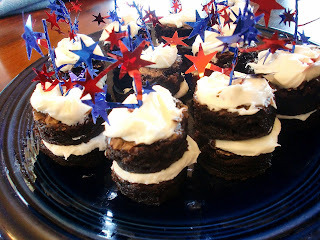 To make these brownie firecrackers, prepare a box brownie mix according to the package directions. Then let it cool completely. Cut the cooled brownie into small circles with a small cookie cutter. Or a knife if you're really talented. Or a rolled up piece of card stock if you need to. Then stack them with a good amount of frosting in between. I cut a piece of patriotic garland into smaller pieces to make the sparklers on top. Please remind people not to eat them. This week is filled with celebrations of independence and freedom. The Fourth of July is an amazingly patriotic week, but I always think about the phrase: God Bless America. It's not so much about flags and fireworks, but about praising God for the blessings on our nation. 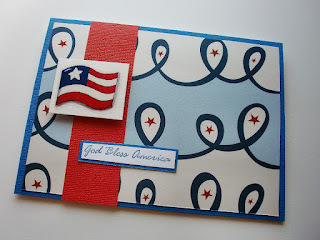 So I made a couple of adorable Fourth of July cards with just that theme. This one is made from a few scraps I found in a bag - I bet you have some, too! The flag is raised on some 3D adhesive for added dimension. I have two different God Bless America stamps, but this one fit the space better. And this sweet patriotic bear has been in my collection for absolutely years! Now he has a special place on this Fourth of July card. You don't have to plaster religion across the front of everything to share God's Word. Instead, I used this powerful verse of Scripture on the inside. This is a great way to use something typical for the time of year and still share your faith. "Well, that all worked out in the end, didn't it?" "And then everything just came together!" "I couldn't believe the timing of it all." We hear these innocent statements all the time. Circumstances just work themselves out, people come together when they're needed most and the events of the day wrap up like a tv sitcom after half an hour. Can you believe that you've already been thought over today? Things aren't just going to happen in some random way and people aren't just going to wander through your life. God says right here in His own Word that He is thinking toward you. He has already had thoughts of peace for you and the day you'll have today.